Another term is ending for me and one theme that stands out for me is part of a lecture that I gave my students in my American Politics class. (The department renamed the course United States Politics, but my default over twenty years is American Politics. I know, I’m exercising American exceptionalism here or you can accuse me of that). The lecture was a primer one on how to do well on the assignments and I spoke to critical thinking and need for a higher level of analysis. I also advised them to come see me in my office hours. Then, I did something that I do not normally do. I referred to that site that allows people to rate instructors. You know which one that I am referring to–don’t you? It is like Voldemo…you cannot say the name! The reason I referred to the site, as I explained to my students was that the last time I had quickly reviewed my ratings, I noted one person say that it is important to get me to like you. I recall having a quick laugh and smiling for the next twenty minutes, as this is not true. I told the students in my class, “I like all of you. The difference is that some of you will like me back.” I explained that my life is quite full and I am content. I also shared with them that my teaching philosophy statement notes that I am not in the habit of chasing the 5, which is the perfect score on our teaching evaluations. Yes, I had included this sentence in my dossier for a teaching award, the Faculty of Social Sciences Excellence in Teaching. I was honored to get the award! Back to my comments to my students, I was extremely honest with this group and later left the classroom feeling satisfied with this moment of brutal honesty. The fact that a person or some people would think that instructors only “give” good marks to students that they like is false. Trust me, I have run the Excel equation and said, “Oh, no.” This is that moment when you really want a student to do well, but one assignment or two assignments sealed their mark with a C or worse. You feel for the student, but there is nothing you can do. Ultimately, what I told my students is that I try to have an open mind and that many of them come from various places across the province and some out of province. Regardless of where they are from there is a whole host of different views and more importantly different abilities with writing, thinking, and success with the work of being a student. I also explained to them that they will perform better in courses that they are interested in and should try to take courses that appeal to them. Then, they need to show up. Go to class, go to office hours, and get to know their instructors or Teaching Assistants. I even referrred to Wil Wheaton’s comments in a high school yearbook and he said the same thing: go to class, go to office hours. I agree with him. (Hey, follow him @wilw). In my opinion, it is not a matter of my liking you. No, it is about my assessment of the work and hopefully seeing an improvement through the term. This puts a smile on my face. It is great to write on the assignment: your work has improved, bravo! The students who I mentor or coach I get to know better and subsequently do like them in a different way. I have had more opportunities to get to know them. And, I must say here that I have mentored more students who hold political opinions that are quite different than my own. My mentoring or teaching does not take this into consideration. Most years, I find that I am mentoring an equal number of women and men students; even though our campus is 60% women and 40% men. Overall, I would be hard pressed to say that I dislike a student. No, I am more apt to feel a negative thought about a colleague in another unit, who pontificates about how teaching is beneath us or questioning my presence on Senate as a teaching focused professor. These sort of statements rub me the wrong way. I have a special place in students’ lives. I am part of their college experience. I can be a mentor or coach. I get to work with them and I think that is an honor. I do, but today I have 70 items to mark so it feels somewhat burdensome, but overall I think that I am in a great place. I was reminded of this last night when I attended a former student’s wedding. I had met her parents before, but to hear that to this day she still talks about my classes–I was touched. Over the course of my career, I have met many siblings and have taught all the siblings in several families and have had coffees to meet my students’ babies. Like I said, I am lucky and know that some of my students will like me. The tumbler below is from a former student. She has also worked with my kids–it is a small community. I wish her luck with what is next! It’s interesting to see that being liked by students is often viewed as a negative thing by some colleagues. One of the things that I have now resolved to not do is apply for teaching awards. I have won one and I have been nominated for another on more than one occasion. I am done. I know that I am an effective professor, and love teaching and working with my students. And, that is all that I need. 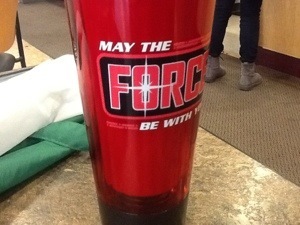 The force is strong in this academic administrator! The acceptance letters are going out to all the Grade 12 students. I am reading lots of books about teaching and technology, and reflecting on the ways in which we talk about first year students and technology. I felt it was worth continuing this conversation. The New York Times article “Growing Up Digital, Wired for Distraction” made the rounds, but since there have been other similar articles. It is to easy to blame technology on the disconnect that educators find with the current cohort of students in our first year courses. I am going to speak to this notion that the Net Gen are artful multi-taskers and think differently. Instead, what we really have is a cohort of young people who are used to using technology all of the time for gaming, fun, communicating, research, school work, and for making connections with others. Of course, some are using technology merely for gaming or social networking, but you get my point. Part of my job is to acculturate students to the environment of higher education. This is why my course syllabus states that students should be taking notes or checking the course Moodle site, but not gaming during lecture. It’s distracting to those around them and frankly, if you want to game, download music–do that outside of the classroom. This notion of the Net Gen being better at multi-tasking has been disputed on several occasions this year with new research that states that the Net Gen are no better at multi-tasking than previous generations. I am not a tech Luddite. I have an iPhone and have often been an early adopter of different technology or applications. However, I tire at the sheer number of articles that extol only the virtues of technology in reference to youth. This New York Times article doesn’t do this, but it opens up the door to excuse making for rude behavior in the classroom and in communication. If the Net Gen wasn’t spending hours online gaming or connected to Facebook, they most likely would be on the phone for hours with friends. Technology has replaced other great time vacuums that previous generations used. Here, all of this conversation is directed toward youth who have access to technology. These are really first world concerns and conversations. We need to remember that ultimately lots of business and human interaction takes place face to face. This is where we need to remind the Net Gen about classroom etiquette and communication etiquette online and offline. In much the same way, though, educators need to be realistic about their teaching and make sure that the material and means of presentation of the information is engaging. And, we need to equip are students with skills to use the technology well. We are all in this together. I have just reviewed the Course Experience Surveys (CES) for my courses. These are the evaluations and I am pleased with the numbers. I’ll need to ask the admin to see the written comments, which are usually fun to read. We all know that the students who really liked you or didn’t really like you are the ones to leave comments. Particular to this last school year, I changed a few things and the numbers demonstrated an improvement. One question refers to the assignments and another to fairness with the grading. These two questions really allow the students to comment on the syllabus and the grading performance. Of course, part of this is that the students can blame the instructor for their mark in the class, but that is a different blog post. The first thing that I’ll admit to is that by and large my CES or evaluations for my courses are normally good to great. But, like any educator focused on teaching and learning, I want to improve my statistics. My enrolments are strong in my courses and I usually have long waitlists for my courses, so I’m doing lots of things right. I won’t rest on my laurels and not try to work on things. And, I’m cognizant that I teach most of the gender courses and other controversial topics, so this influences the evaluations to some degree. What did I do different you might wonder? I made special care to talk more about the assignments in class and dedicated more time to do so. I also increased the explanation time when reviewing the syllabus and the assignment. I joke with colleagues that some students need to hear the explanation three times in order for it to sink in and this might not really be a joke! I did this with all six classes this last year—from first year to seminar. Hypothetically, let’s say I was I was interviewed by a local reporter a few weeks ago. And, since this is a hypothetical situation I’ll go ahead and leave the reporter nameless. Again, this is all just for kicks and giggles as I would have to make this sort of story up, right? I was initially contacted for an article to run prior to March 8, which is International Women’s Day. Ultimately during the interview it became apparent that the interview was on background and that the reporter and I did not see eye to eye. Now, both these points are fine. I knew that this interview was different than other interviews. I was told that I would have an opportunity to review my quotes. I’m sorry but I do not get that opportunity. I’m not George Clooney or Oprah! At that time I new that I was dealing with the junior varsity squad. Regardless, imagine my surprise when I was asked this question, “So, me and my girlfriend are 25 and like, well, thanks to feminism we are having a hard time finding a man to take care of us.” I started to cough. She did and it was pretty much the same sentiment. I moved into a spiel about class, race, and education privilege. And the response was, “Oh, I never thought of it that way.” I changed the subject to how so many people don’t really know what feminism is about and how the Feminist Political Thought seminar did a “homework” exercise requiring them to speak to someone about feminism. She listened and our call ended and I realized that the article was going to be interesting. The article that this reporter wrote essentially argued that feminism has gone too far. My first point of contention. We have feminisms. There are different variants and theories that it’s so easy to condense them into one. A previous post of mine discussed this notion of “Big Old Bad Feminism.” My next major issue with the article is that feminism is not partially blame for overtired, overworked, unhappy women. I do think that economic injustice might be more responsible or a society that does not value women’s paid and unpaid work. Now I can get to the issue of racialized women. Racialized women in North America do not have equal access to education and are over-represented in the prison industrial complex. They are connected to the criminal justice system more so than their white, middle class cohort. Unfortunately racialized women are also more likely to be victims of domestic violence and not live as long. Then, if we look to all women, we see that they are doing the second or third shift. Women do more care work compared to men. So, has feminism gone too far? No, my friends it has not. It’s short-sighted and false to make such ridiculous claims. As much as I love my dear, sweet partner–we take care of one another. I could win the Super Lotto tomorrow and I would keep my job. I love it. I’m making a difference in young people’s lives. But, then again, I have more depth to my personality and life experience. Then, I woke up. This was just a random nightmare thanks to my cold medicines. Right? !